There’s never been a better time to treat yourself than in the fabulous sale! It’s that time of year again at fabulous, where we break out some brilliant bargains just for you on end of season pieces. The fabulous sale begins on the 26th December. With gorgeous jewellery from designer names, there’s no excuse not to bag that pretty necklace or elegant pair of earrings you’ve had your eye on! Choose from the likes of bold and beautiful Lola Rose, fresh and funky Spinning Jewellery and contemporary Dyrberg/Kern at up to 50% off the original prices. We’ve also got some fabulous pieces from the Branch, Antica Murrina Venezia and Paul Costelloe at 25% off… and more! With VAT set to rise in January, it’s the perfect opportunity to save a few pennies on some wonderful jewellery collections. Many items have limited availability, so you must act fast – once they’re gone they’re gone! Browse all our sale items here and pick up some bargains today! The New Year brings with it a whole new set of fashion trends – here’s a rundown to keep you looking stylish in 2011! Prada and Stella McCartney both sent designs down the runway featuring bold fruit prints, bringing a fresh and funky feel to the new year. The gorgeous glass kits from Trollbeads are the perfect way to echo the bright colours in this trend on bracelets or necklaces. 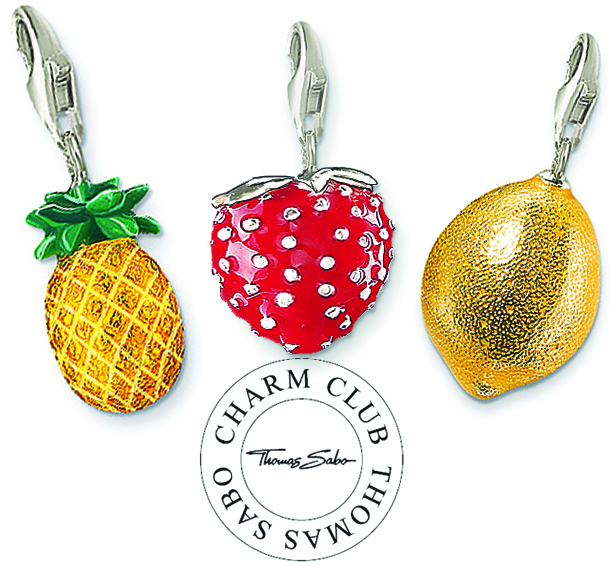 If an all over print isn’t for you, try these gorgeous fruity charms from Thomas Sabo to add a trendy touch without going totally bananas…! Marc Jacobs is just one of many designers featuring a much fuller skirt with a longer length on the catwalk this season. Team the elegance and sophistication of this look with flirty romantic pieces from Linda Macdonald, or with the understated glamour of John Rocha’s organic jewellery. Harper’s Bazaar spotted a trend for ruffles on the Parisian runways, with designs featuring oversized ruffles and intricate detailing making an appearance. Play up this textured trend with Chan Luu’s gorgeous wrap bracelets, which can be worn individually or stacked together to create a contrasting look. Or, you could team the delicate nature of ruffles with the classic and elegant stylings of Dower & Hall, featuring simple hearts and highly skilled craftsmanship. Treat yourself before the VAT rises are put in place! VAT is set to rise from 17.5% to 20% on the 4th January, which means that the prices of many consumer goods will rise. Some fabulous designers have already notified us of their price changes, including favourites such as Nomination and Pandora, so if there’s anything you’ve been unsure about buying, now is the time to do it – that way you’ll escape the extra cost, and still get your hands on the same gorgeous items! If you want to know any more about the VAT rises and how it will affect you, there’s a great BBC article here that will tell you all you need to know. And if you need any advice on what will be happening here at fabulous, then drop us an email and we’ll happily answer any of your questions. Thomas Sabo charm boxes are finally back in stock, and we’ve got some great Christmas giveaways too! What better way to keep your favourite charms safe and sound than in a gorgeous Thomas Sabo charm box? These stylish jewellery boxes are modelled to look like hat boxes, and provide tons of space to store all your Sabo charms and bracelets. They make great gifts for Sabo fans this Christmas at only £15, so make sure you snap yours up soon! As we’re feeling all Christmassy at fabulous, we thought we’d offer you a special Sabo free gift! So, if you spend over £50 on Thomas Sabo, we’ll give you a free 2011 Sabo diary, to make sure you’re stylish as well as organised this new year. And, if you spend over £100 on Sabo, we’ll send you a free charm box to go with your new accessories! Find out more here! Well, if we can’t spoil you at Christmas then when can we?! Combining the luxury of Diamond with the classic simplicity of Sterling Silver, fabulous are pleased to welcome Hot Diamonds to our collections. Established almost ten years ago in the UK, Hot Diamonds were some of the first jewellery designers to offer an innovative design breakthrough allowing them to set Diamonds in Sterling Silver. As one of the nation’s favourite Diamond jewellery brands, they now offer wearable, fashion-forward collections that celebrate modern design and play with shape and form. Exquisitely crafted in Sterling Silver and 18ct Gold Vermeil, Hot Diamonds jewellery is designed with four reference points in mind: love stories, symbols, statements and soul. 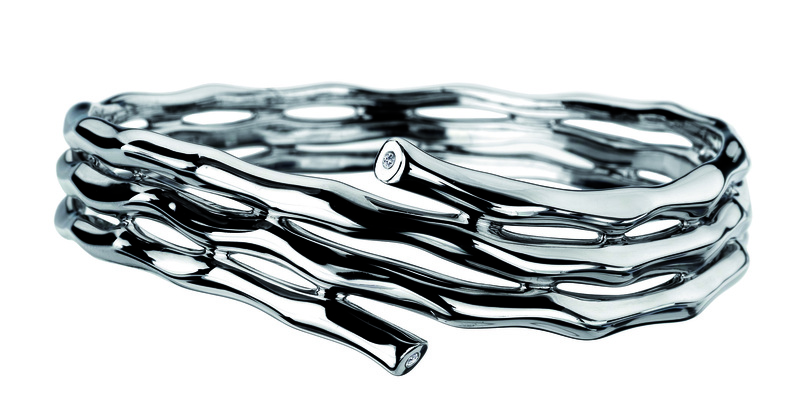 Free-flowing organic shapes, inspired by nature, are combined with an intricate attention to detail, ensuring that each piece feels luxurious and high-quality. Creative Director Julie Large states, “I am eager to weave mystery and sensuality into jewellery designs that appeal to modern women and men – ultimately they will pass on these beautiful keepsakes to future generations.” Julie claims that, “as a jewellery collector as well as a designer I want to be seduced by jewels”, and the graceful, feminine shapes and fluid style of these pieces certainly promise to beguile the wearer. fabulous are proud to be stockists of the li mited edition Black collection, featuring the natural forms of the Ionia collection and the delicate circular cut outs of the Bali collection. Our favourite pieces include the Bali Maxi Orb Necklace, with an extra long length that makes it really wearable all year round, and the Ionia Wrap Bangle, with a subtle sparkle perfect for the party season. Shop the Hot Diamonds collection. Charm bracelets are bigger than they have ever been right now, but have you ever wondered where they come from? The history of charms dates back thousands of years, beginning as simple amulets that would ward off evil spirits. The first recognisable charm bracelets appeared with the Egyptians, who saw charms as symbols of faith, luck and status, and also thought they would serve to identify people to the gods in the afterlife. Charms were often used to signify religious beliefs – Christians would secretly carry a fish symbol with them to identify them to other Christians, whilst Jewish scholars would wear amulets containing rolled up scripts, in order to carry Jewish law close to their hearts at all times. During the Medieval period, knights wore charms to protect them in battle, and they began to represent family origins and professions as well. Charms began to go out of fashion as people became more educated and less superstitious with the advent of mass-produced books during the Renaissance. However, in the early 20th century, Queen Victoria inspired a fashion craze for decorative charm bracelets among the European noble classes by herself wearing a collection of locket charms containing family portraits on a bracelet. During World War Two, soldiers would send home trinkets made by local craftsmen in the areas they had been posted. In the 1950s, charm bracelets became incredibly popular in America, and today there is a huge demand for vintage charms from this era. Nowadays there are a huge variety of ways to wear charms, from the traditional hanging style of Thomas Sabo, through to the modern European interpretations of Pandora and Trollbeads, whose beaded bracelets provide really wearable pieces of jewellery that play with the charm concept. Scarlett creates symbolic charm beads engraved with meaningful words and phrases. The Italian take on the charm bracelet has proved enduringly popular with young and old, men and women alike – Nomination bracelets feature a simple band with interchangeable charm links, with thousands of diverse links to choose from. Charms don’t just live on your bracelet either – there are now necklaces, anklets, earrings and many other ways to incorporate your charm accessories. Spinning Jewelry is are one of the latest charm ranges to develop a new way to customise your jewellery, with a range of stackable rings and bangles that you can mix and match to your heart’s content. Here at fabulous, we love charm bracelets because they allow you to express your own individuality and style really easily – there’s a charm for everyone, and a different way to wear it too. We also love the idea that you can build a picture of your life – your memories and milestones, the people, places and things that you love, and your own personality – and take it with you wherever you go. It grows with you, changing as your life changes, and makes the perfect, timeless keepsake. With the festive season fast approaching, we thought we’d remind those men of yours that it’s time to treat the wonderful women in their life with the perfect Christmas gift! Our Christmas Men’s Day will take place at fabulous stores in Leamington Spa, Solihull, Milton Keynes and Bath this Thursday 2nd December. We know that jewellery can be a little daunting for all those menfolk out there, so we’ll be making them feel a little more at home with beer and nibbles – and some friendly, helpful advice from our fabulous staff, of course! There’s also a free gift-wrapping service, so they have no excuse not to leave a gorgeous gift under the tree this year. And as if that wasn’t enough, we’ll also be offering a 15% discount on purchases for the whole day. There’ll be plenty to choose from, with designers such as Lola Rose, Pandora, Nomination and Linda MacDonald, as well as our newest arrivals Argent of London and Paul Costelloe, so make sure you tell your man to pop in for a mince pie and a browse! If you can’t make it into one of our stores this week, you can still enjoy a 15% discount on our website from Thursday 2nd to Sunday 5th December – we’d start leaving some hints now to guide them in the right direction…! Happy Christmas from fabulous – don’t say we never spoil you!